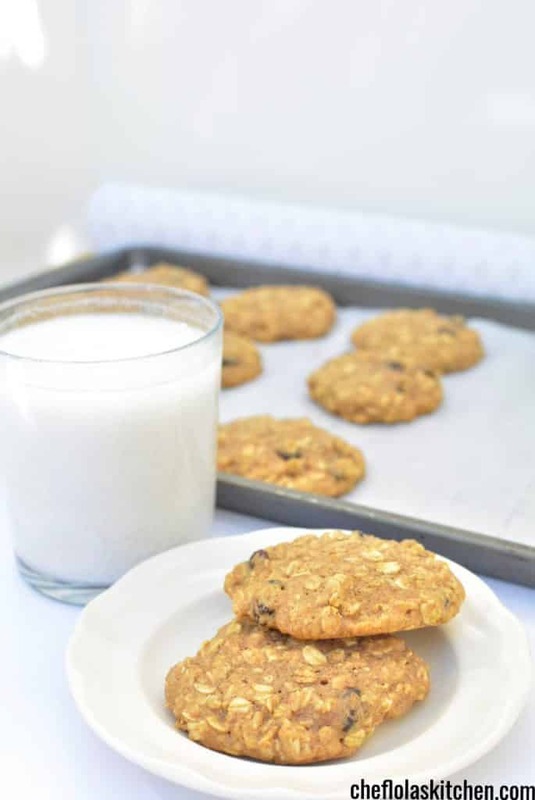 Who can resist the goodness of Sugar-Free Oatmeal Raisin Cookies? These cookies are sure going to make a great impression. The edges have a slight crunch and the middle is soft and slightly chewy. 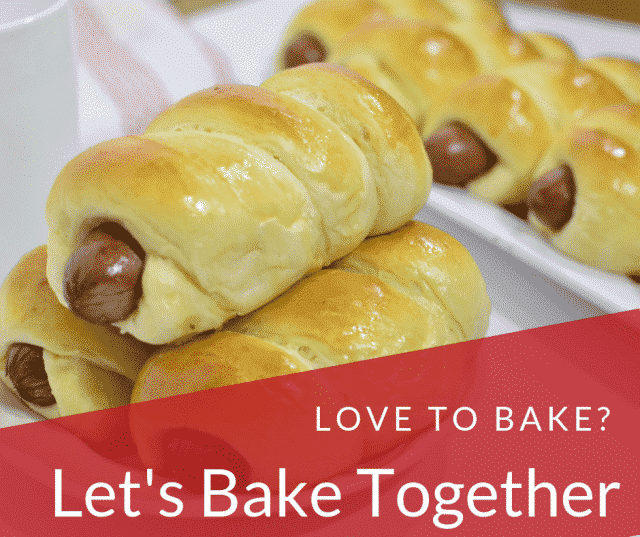 This recipe is really fun to make even kids will be excited to join in the process. It takes only about 10 to 15 minutes to bake. It might still look underdone at this point but don’t worry just take them out of the oven while they still look underdone they will continue to bake and harden as they cool. Lining the baking pan with parchment sheet is very important because it will make your baking pan come out clean and your cookies release effortlessly. I used the old-fashioned oats for this recipe. 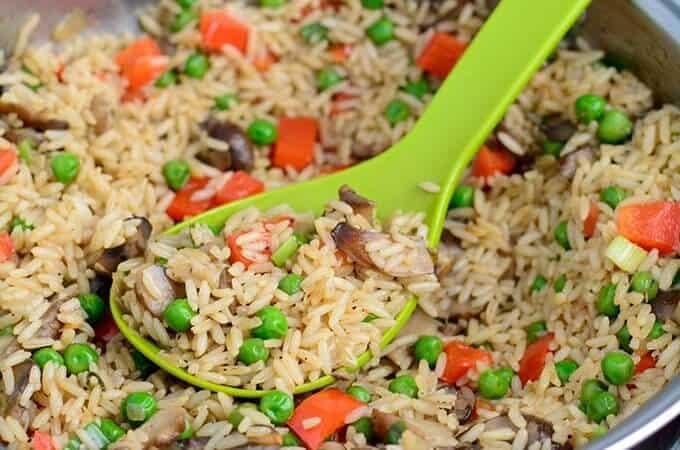 However, you can use the quick oats for this. If you have any leftover simply store it in an airtight container on the tabletop for up to 3 days. These cookies are delicious and tempting. They will satisfy your sweet tooth with no sugar but honey! Mix the Oats and the whisked Egg and Coconut until combined. Add the Honey and fold till just combined. Add the flour in two batches. Fold in the first half until just combined. Repeat for the second half. Then, fold in the Raisins and place it in the Fridge for 20 minutes to solidify. Drop one heaping mound of cookie dough into the prepared sheet spacing them about 2 inches apart and Place in a 325F preheated oven for about 12 to 14 minutes or until slightly brown. Putting mine in the oven now! 🤗 Cant wait to see how they turn out! 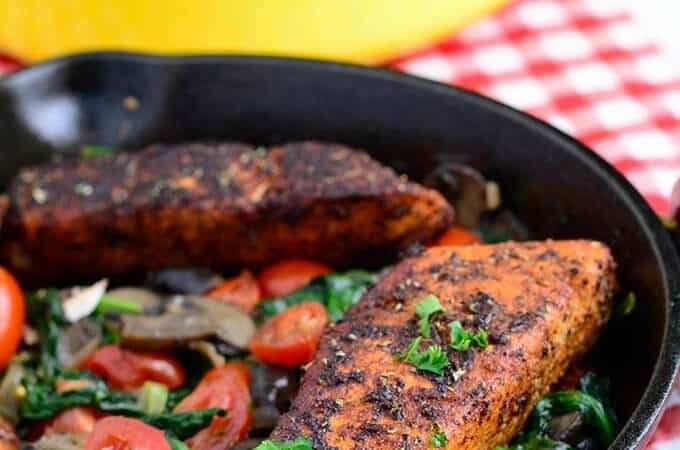 Such a great sugar free recipe! 2nd time making these and am blown away! I’ve doubled the recipe both times and they still comes out great. Thank you Lola! These cookies look delicious! How much time will they last in the fridge? Thanks, Diana. These cookies should not be stored in the fridge. They will last longer when store them in an airtight container on the table top. However, if you want to keep them for a longer period, put them in a sealed bag and place them in the freezer. 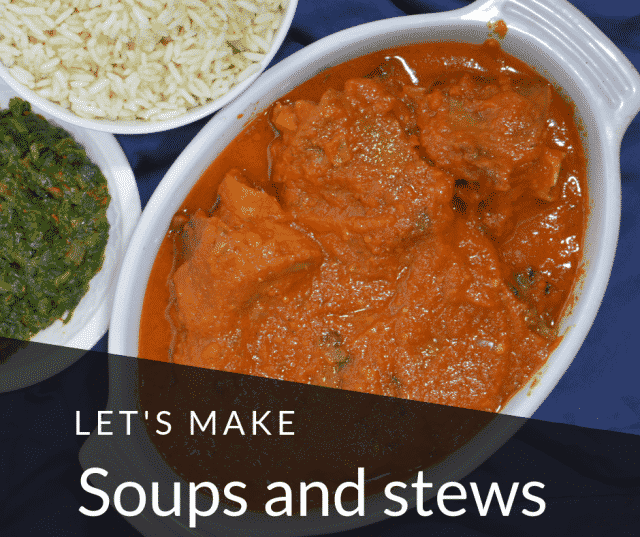 Hi Nkechi, I will advise you not to tweak this recipe by adding sugar. 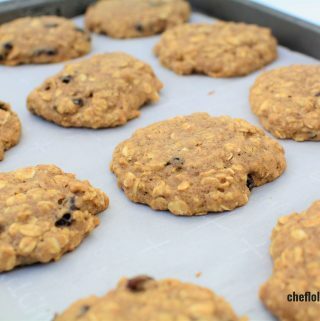 I have a recipe here for a brown sugar cookie here’s the link https://cheflolaskitchen.com/soft-and-chewy-brown-sugar-oatmeal-cookies/ I hope that helps? 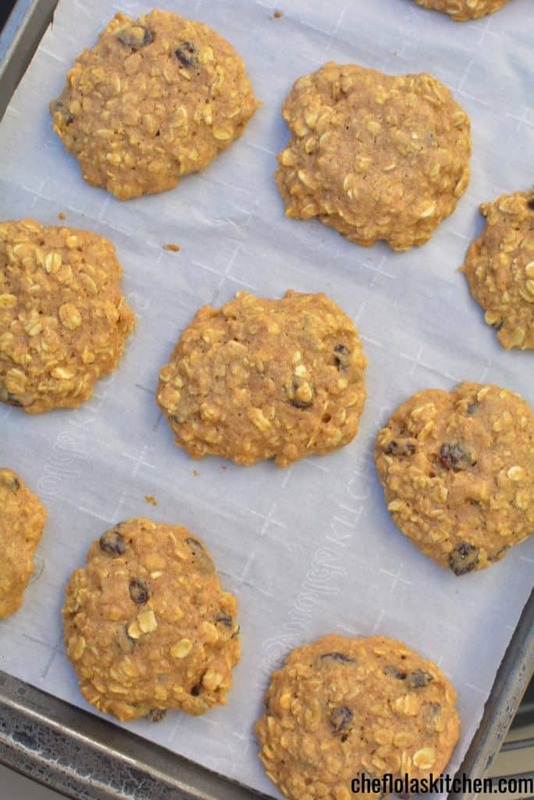 Oatmeal raisin were my favorite as a kid and I haven’t made them in years. Thanks for making them sugar free. These are so great for an afternoon snack. My kids love them! 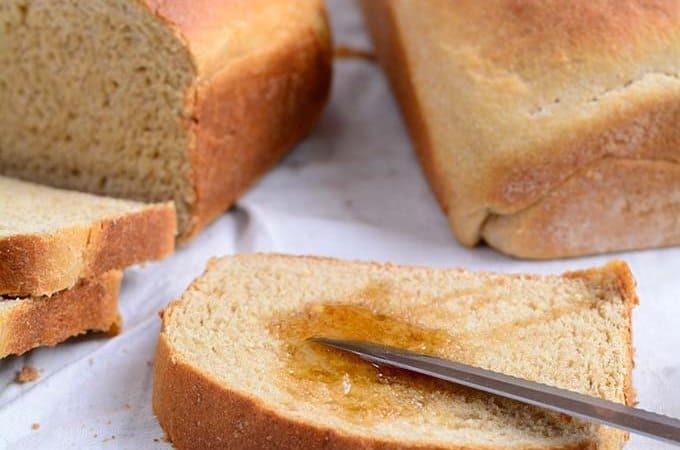 Such a great way to use honey instead of refined sugar! Thank you for this! Love this healthier take on a cookie classic! All the flavor and no guilt! these look so scrumptious! 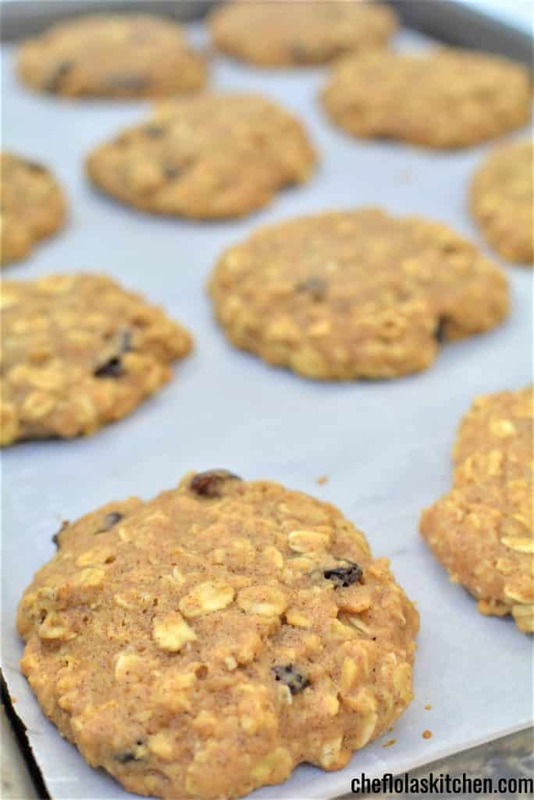 I love that they are made with oats and have raisins to add a bit of sweetness to them! 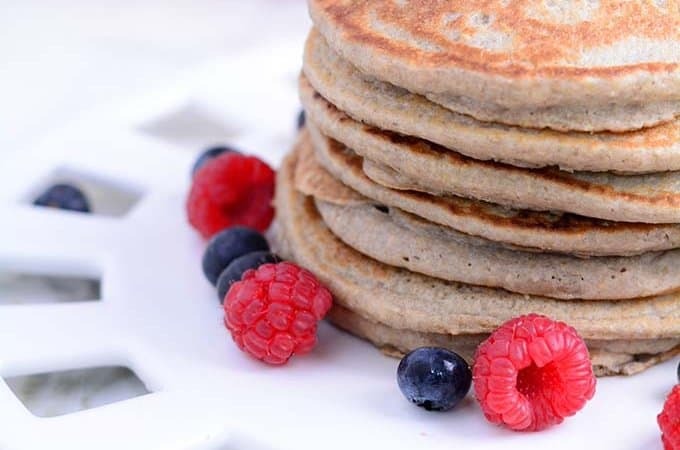 Tasty and healthy cookie!